H.J. Shepstone : The Surf Board Riders of Hawaii, 1912. Shepstone, H.J. : The Surf Board Riders of Hawaii. England, November 1912, pages 29 to 35. This important document was kindly made available by Dan Pincetich of Huntington Beach, California in September 2012. Although H.J. Shepstone strongly implies that he visited Hawai'i and witnessed surf board riding, "which may be seen here," this is yet to be independently confirmed. Some of the terminology strongly suggests that the author has consulted previously published articles; at least Alexander Hume Ford's A Boy's Paradise in the Pacific (1908), if not others. Also note the similarity in title to A.J. Gurrey Jr.'s The Surfriders of Hawaii, published around this time. Furthermore, what appear to be specific references to the Waikiki Regattas of 1907-1908 suggest the article, or its sources, was wriiten well before the publication date of 1912. Shepstone begins with a quotation from Sir Fredrick Treves, confirming that surfing's finest location is Waikiki Beach, and notes several unsuccessful attempts to introduce the sport to other countries, particularly the United States and Australia. Despite the appearance of boardriders at Atlantic City "a few seasons ago" (persumably the Hawaiian quintette in July 1910) and at San Francisco by "a Hawaiian youth specially brought from Honolulu" (presumably George Freeth, 1907-1910), the locals had not embraced the sport. The surfboard is "of light mahogany, some six feet in length by eighteen inches wide" and, while having little floatation when stationary, the "heaviest man may stand" when riding the wave. Several months of practice are required become a competent surfer. Instructions from prone riding include steering, whereby you "throw your legs to right or left" (echoes of Ford), and when riding standing the stance is adjusted so that the "plank swerves and descends the watery hill on the bias." There is also surfing in outrigger canoes and "'body surfing' ... when the waves are high." He writes that although surfing is a traditional native sport, at "the Christmas contest last year ... a white youth, only sixteen years of age", was "the most expert surf-boarder," coming in "on a monster roller standing on his head." Additionally, "only last season," a game where inflated bladders are speared by passing boardriders was "introduced at Waikiki"
and at "a recent night water carnival at Waikiki was illuminated surf-boards." The first corresponds to the performance of Harold Hustace at the Waikiki Regatta of 1907, the second descibes the illuminated Aquatic Carnivals of 1908. Shepstone wrote that surfing was popular amoung the elite of Hawai'ian society and of "spacious grounds (with) bath-houses, canoe-sheds, and surf-board racks," an oblique reference to the (un-named) Outrigger Canoe Club premises at Waikiki. While some of the twelve accompanying photographs have been previously published, the vast majority are rare. The photographers are not accredited. The opening quotation is from Sir Frederick Treves' The Other Side of the Lantern, an account of his world tour published in 1905. While Shepstone questions whether Treves observed surfboard riding while in Hawai'i, the knight's account of bathing at Waikiki is certainly based on personal experience. 1905 Sir Frederick Treves : The Other Side of the Lantern. 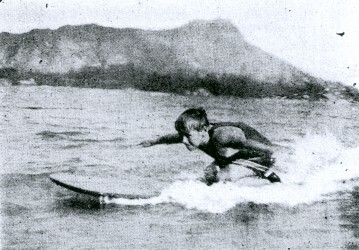 Selections from Shepstone's article were later published under the title The Surf-Board Riders of Hawaii by New Zealand's Otautau Standard and Wallace County Chronicle on 4th March 1913. Harold (Herold) .J. Shepstone was a prolific journalist, author, and photographer. His work was published in a variety of newspapers and journals and covered a wide range of subjects and locations. However, it is unclear whether his "foreign" reports were based on personal experience or compiled from available sources. Shepstone was a regular contributor to The Wide World magazine between 1899 and 1932 and is listed as an editor of Scientific American in 1905. Underwater Photography, Pearson’s Magazine, November 1900. Modern Daniels : Feats in the Lions' Den, Windsor Magazine, London 1900/1. The Dress Censor, The Daily Mail, London, August, 1907. The Romance of Seal Hunting, The Wide World Magazine, 1909. Dead Sea, hitherto a barren and dreary spot, Popular Mechanics Vol. 58, No. 1, July 1932. Lawrence of Arabia, Boy's Own Paper, November 1939. Cavalcade of Ships, The Sunshine Press, UK., c 1930s. Wild Beasts To-day, The Macmillan Company, New York, 1932.
reading his account of its delights and thrills will be inclined to cavil at the description. has taken to it with enthusiasm, and bids fair to beat the native at his own game. 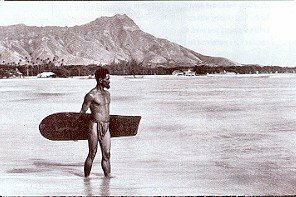 A native Hawaiian with his surf-board. version of this photograph, circa 1890. "One of the great joys of Honolulu is the sea-bathing, for nothing can surpass it. Those who find delight in this rudimentary pursuit must go to the Sandwich Islands to understand it in perfection. It may be claimed that there is luxurious bathing on the Lido by Venice, or at Atlantic City, or on the coast between Cape Town and Durban. These places, as Mercutio said of his wound, will serve, but they fail to approach such bathing as can be found in the cove which lies in the shelter of Diamond Head." Whether the famous surgeon witnessed the remarkable sport of surf-boarding and surf-canoeing which may be seen here I do not know, but that it is one of the most exhilarating and fascinating of pastimes there is no denying. Indeed, I would term it the king of summer sports. Go to Honolulu and try it, and you will quickly be convinced. Driving a motor-car at sixty miles an hour, guiding the tiller of an ice-yacht as she flies before the wind, or rushing through space on an aeroplane is nothing to the sensations experienced as you are tossed about like a feather, on a frail board on top of a spuming wave, and then hurtled shoreward at express train speed amid a cloud of spray. There is only one spot where this fascinating sport can be seen and indulged in at its best, and that is at Waikiki Beach, not far from Honolulu, the capital of Hawaii. True, attempts have been made to introduce the sport into the United States and other countries, particularly in Australia,but they have invariably failed. A few seasons ago a number of surf-board enthusiasts appeared at Atlantic City. They manfully rode over the breakers, but failed to induce the people to take up the pastime seriously. Then, at San Francisco, a Hawaiian youth was specially brought from Honolulu to teach Americans how to ride upon the waves, but he soon returned home disgusted at the little interest taken in his exploits. These fallures, however, arose from a variety of causes. A general view of the beach at Waikiki, showing surfboard enthusiasts at play. [Photograph. #2. Spread across the top of pages 30 and 31. #3. A circular cropped photograph - one surfer stting, one standing, and two riding tandem. From a) Just through the breakers. [photograph. #4. A circular cropped photograph of two riders, spread across the bottom of pages 30 and 31. ... as those found at Honolulu. Moreover, the sport is one that emands nerve, pluck, tact, quick judgment, and the exercise of considerable patience. You cannot hope to become even a third-rate surf-board rider under a couple of months' constant practice. Indeed, it takes a whole season to master the intricacies of the art. Waikiki Beach, where this wonderful sport may be witnessed, is some three miles from the centre of Honolulu, and is easily reached by tram. It is virtually a curve in the the shore fronting directly on the vast Pacific Ocean, yet protected by a great coral reef nearly a mile from the shore. Against this barrier the mighty rollers from the sea stub their toes, so to speak, and pitch headlong in foam-crested ridges across the lagoon and on to the coral sand of the beach. The great trick is to ride upon the first or outer wave and be carried by those that subsequently form right on to the beach. The boards used are of light mahogany, some six feet in length by eighteen inches wide. Upon this frail craft the heaviest man may stand, if he knows how, while the force of the wave is behind him, but in quiet water it will readily sink under the weight of a child. Like every other kind of sport, surf-board requires a certain knack, and the knack here is to send your board ing through the water at the right moment and at the right speed. To do this really successfully you must develope certain muscles in the arms and shoulders. A trick-rider- This feat requires wondertul skill and judgment. #5. A circular cropped photograph of a rider standing on his head. ... legs like the paddles of a canoe. Having mastered these points, you start for the long rollers beyond the breakers. As the waves roll over you you dip the bow of your board and go through them. Once out where the big rollers begin to form, you mo~t your board just as a wave with a feathered edge comes along. The moment before it reaches you you throw your arms rbt:lnd rapidly, pushing your craft forward as fast as you can, as if to escape the wave behind. If you have judged the right moment and are speeding your board fast enough, the oncoming billow will carry you before it, and on that great sloping wall of water you keep slipping down and down, but never quite reaching the bottom of the briny abyss. Then the wave breaks, and you are flung before it with the speed of a cannon-ball toward the sandy beach. You throw your legs to right or left, according to t,he direction you wish to go, and keep your arms rigid; grasping the edges of your board, if lying down. If you wish to rise to your feet you must do so in the flash of a second, and then balance yourself. That is about all there is in surf-board riding, but what practice is demanded before you have mastered these apparently simple rules! Daily you go out beyond the breakers, only to be ignominiously capsized again and again, to have your board snatched away from you by the mocking waves, and to return disheartened. I know several expert surf-boarders who will tell you that they practised several hours a day for months before they learnt the elusive knack of the game. Merry parties engaged in "surfing." #6. A photograph of two surfing canoes, spread across the top of pages 32 and 33. The canoes and paddles used for "surfing." #7. The white costumes of the paddlers probably indicates they are members of the Hui Nalu. Once you have grasped it, however, and have ridden upon the crest of a wave or been carried before it, you experience a thrill and a sensation which only a sportsman can appreciate. It takes muscle and endurance, lying upon a bit of plank with only an inch or two of the bow above water, just to paddle a mile out to where the great waves form. Next there is half a minute of violent exercise, and then several seconds of supreme effort, for the board attempts to rise upon the wall of water, and one has to fight to keep it from floating above the crest and sinking back to the rear, thus losing the wave. Even on the summit of the billow one can save the situation; a few powerful strokes of the arms and feet as you lie with your face flat upon the plank will often put you right for that triumphant forward rush. Every muscle exerted as you realize you are making progress. Then you feel your feet tilt slightly upward. Down go your arms, grasping the board amidships in a grip of iron, while your feet are drawn up to the centre of the plank with a quick, convulsive motion and you leap to your feet, erect, and balanced. If you fail, the board flies from under you and is tossed into the air. If the wave is conquered, however, there is a thrill like none other in all the world as you stand upon your tiny craft and look down into the hollow green valley before you. As the wave curls ready for breaking the strongest foot is put forward to keep the bow down in a slanting direction and, a quick turn is given to the whole body, so that the plank swerves and descends the watery hill on the bias. Almost as fascinating as surf-board riding is the sport of surf- canoeing. The exhilarating rush through the foam. #8. Two surfers, one standing and one prone. ... four to six may take part; some of the more daring spirits even ride the waves in a tiny canvas canoe. The canoes that take a crew are known as outriggers, and the paddle that guides is invariably in the hands of a native. It is his duty to see that the craft does not turn broadside on to the waves and get swamped. It is a sport, however, that almost invariably ends in a swim, for if you ride the first wave or two successfully you are always liable to get swamped by the next. Seated in the frail boat with your companions, you wait patiently, half a mile from the shore, for a great roller. As it comes sweeping in the shouting and paddling become fast and furious. Every muscle is brought into play as the great native paddles are dipped into the water. If sufficient speed is attained the craft is carried up on the broad billow, only to speed down-hill again like the wind. Here skill and judgment are required. When the wave breaks, if it is a big one, it is necessary for everyone to rush forward to the bow of the canoe, and as the wave begins to die out to work back again. ... smaller waves right on to the beach and landed there high and dry. The small boy at Waikiki does not stop at surf-boarding or surf-canoeing. He delights, when the waves are high, to startle new-comers by giving exhibitions of "body surfing "- that is, he uses his body as a surf-board and comes in on the wave, only his head appearing through a wall of water. It is a difficult feat,but the natives of Hawaii spend half their lives in the water, and swim like fishes. Nevertheless, it is a curious fact that in all recent aquatic caniival which have been held at Honolulu the prizes have been carried of by white men and boys, despite the fact that the competitions were open to all comers. To-day the Judges of the Supreme Court in Hawaii, with their wives and daughters, ex-Governors and their families, and the greater portion of the permanent business men, are surf-board enthusiasts, while the schoolboys and girls of Honolulu, now that they have spacious grounds near the beach for their separate bath-houses, canoe-sheds, and surf-board racks, spend much time in the water. #9. A circular cropped photograph of juvenile surfer riding kneeling. Kahanamoku, Duke Paoa: Riding the Surfboard. Honolulu, Volume 1, Number 1, January,1911, page 6. Caption: A Small Boy Paddling Out on a Big Board. #11. Riding standing, prone, and laying on the back. Quite at home amoung the breakers. #12. A circular cropped photograph of one surfboard rider. ....only lately mastered the art that was for so long believed to be possible of acquirement by by native-born dark-skinned Hawaiians. At the Christmas contest last year, for the first time, a white youth, only sIXteen years of age, won the medal given to the most expert surf-boarder. He came in on a monster roller standing on his head. This was rightly regarded as a particularly clever feat, for it is difficult enough to balance yourself upon your feet on a swift -moving board, let alone upon your head. The white man, as a matter of fact, is doing great deal in developing the art of surf-board riding in Hawaii. Games and feats never dreamed of by the native are being tried. A sport introduced at Waikiki only last season, for instance, is worth mentioning. Inflated bladders are anchored where the waves roll in. Mounting their surf-boards, and carrying a sharpened reed-spear in one hand, the competitors are carried at racing speed through the surf. As they dash through the wave they endeavour to puncture the bladder target with their spear, the rule of the game being that the spear must be thrqwn while the spearman is actually standing upon his board. One of the features of a recent night water carnival at Waikiki was illuminated surf-boards. Acetylene lamps were strapped to the bows of the planks and successfully ridden over the breakers: All one could see was a man standing erect, coming through the spray, in a circle of light. One American youth came in standing on his hands in the glow of a red signal-light attached to his board. He had carried matches out in his skull-cap, and lighted his torch just before he caught the wave he wanted. Shepstone, H.J. :The Surf Board Riders of Hawaii. November 1912, pages 29 to 35. Geoff Cater (2014) : H.J. Shepstone : The Surf Board Riders of Hawaii, 1912. Click Magazine - The National Picture Monthly. Fray Juan Crespi: Missionary Explorer on the Pacific Coast 1769-1774. 1927. University of California Press.